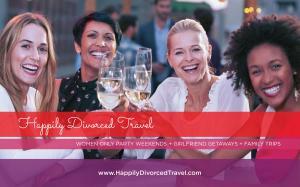 Happily Divorced Travel is a fun purposeful and personal travel funding service for women who make a difference in L.A.; sponsored by Recruiting for Good. SANTA MONICA, CA, UNITED STATES, January 9, 2019 /EINPresswire.com/ -- Recruiting for Good a Santa Monica socially progressive based staffing agency delivers a personal service helping working families, moms, and professionals who make a difference and live in L.A.; fund fun travel. Happily Divorced Travel is a high purpose solution for women who love to travel well and save money. 1. Women live in L.A., make a difference, and love to experience meaningful travel. 2. Women meet 'See the World for Good' team to discuss how collaborative funding happens. 3. Email Carlos@SeetheWorldforGood.com to set a time to meet in Santa Monica. According to Recruiting for Good founder, Carlos Cymerman, "Imagine every year...you saved money on travel to see the world for good with your girlfriends or kids...done with lawyers, therapy, then, join Happily Divorced Travel to celebrate your freedom today."